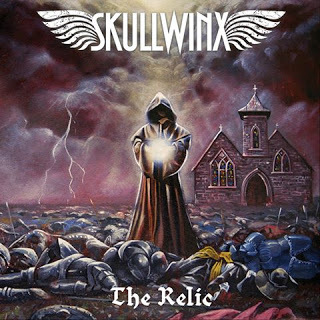 Continuing to mature with each release, German epic speed metallers Skullwinx continue to further their traditionally-minded sound that makes the band faster, stronger and more epic than ever before. Once again doing a concept album about historic tales and legends from mid-Europe as well as describing the bands’ name, the second full-length album was originally released September 24, 2016 on Metalizer Records. Finally bringing their full sound-scape to bear here, this one offers a great chance to fully deliver the kind of raging old-school style approach and attack they’ve been capable of from the start. Ranging from furious, intertwined melodic harmonies in Siegfried, Attila the Hun and Tryst of Destiny that run from simplistic gallops charging along at impressive mid-tempo paces gathering the slow, sprawling lurches that generate the feeling of epic melodies rather nicely here. That also gives this the chance to offer explosive outbursts of furious speed-drenched rhythms in A Tale of Unity (Animus), For Heorot (Beowulf) and Carved in Stone (Princess in the Tower) that drop most of the pretenses of the sprawling epic-flavored rhythms in favor of raucous, blistering speed which goes nicely with the enhanced sprawling atmospheres by creating the kind of vicious, full-throttle atmosphere that gives this one a highly impressive and enjoyable counterpoint that comes off rather nicely throughout here as these two sections are given quite a nice even mixture throughout here which is where this one really manages to get some interesting elements present and scores the most enjoyable facet of the album. The biggest factor against this one, though, is the album’s rather troubling frontman who is clearly ill-at-ease with the grandiose, bombastic nature required for this type of material and to clearly hear him straining to hit the higher notes takes away considerably from the rest of the material. The gruff mid-tone register is fine for the speed-drenched efforts, but going for the lighter notes takes away from this one somewhat. It’s really the biggest issue against this one, though and holds it back when this really could’ve been much better.